Address Please check the Talkie Walkie website for details of walks in your city. On September 9th & 10th, join TELL and others around the world in taking action to combat suicides in our communities and focus public attention on the unacceptable burden and costs of lives lost every day. 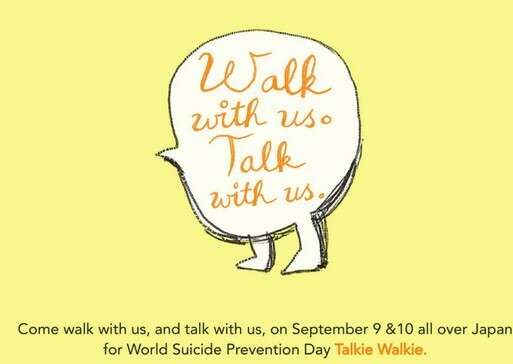 Every year, more than 800,000 people die by suicide and up to 25 times as many make a suicide attempt. Behind these numbers are real people each with their own stories, who have, for many different reasons, questioned the value of their own lives. Each one of these individuals is part of a community. Some may be well linked into the community, and have a network of family, friends and work colleagues or schoolmates. Others may be less well connected, and some may be quite isolated. Regardless of the circumstances, communities have an important role to play in supporting those who are vulnerable. TELL is proud to announce our 4th Talkie Walkie event made possible again by the generous support of Morgan Stanley. You can show your support by joining one of our walks in Tokyo, Osaka, Kyoto, Kobe or Nagoya. Or you can hold your own walk for TELL anywhere in Japan and help raise important funds to get our Lifeline 24/7. Participants will each receive a TELL Talkie Walkie tote bag, that we ask you to gather signatures on the day as you make connections and start conversations along your walk. For further information about walks in your city please visit our Talkie Walkie website site.